Rain ranging from showers to heavy spills expected across Saturday and Sunday. THERE’S SOME BAD news on the weather front this weekend as conditions are forecast to remain mostly unsettled with rain and showers affecting both Saturday and Sunday. Rain arriving along the west coast during Friday night will edge eastwards across the country through Saturday making for mostly cloudy conditions with outbreaks of rain for many areas at first. The rain will turn showery with perhaps some breaks allowing for sun to poke through in one or two places. It may well stay cloudy in Ulster with showery rain continuing here until evening with showers breaking out over the rest of the island. A fresher feel to things with winds southwest to west in direction and moderate in strength. Highest temperatures of 13 to 16C. Breaks in cloud later Saturday evening with good sunshine in places as a weak ridge of high pressure moves across the country but turning cooler after dark with temperatures falling back to 7 to 10C and winds falling light. Some mist may develop over the south midlands towards dawn. The day will start off dry and bright in most places, but cloud will increase along the west coast with rain arriving here in the morning and turning heavy in places. The rain will again extend to remaining areas by the afternoon, making for a cloudy and wet day overall. Winds will blow in from the southwest and will be strong at times. 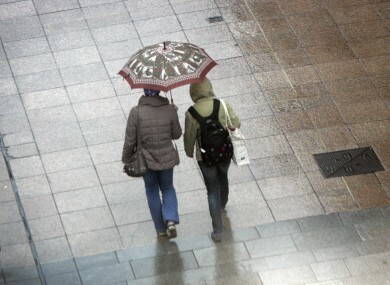 Highest temperatures of 14 to 17C as milder air will accompany the rain. Another band of rain will move northeast across Ireland later Sunday evening and into Monday morning. The outlook continues to remain unsettled as low pressure will be close by – especially for the early days of next week. Rain or showers will be the general theme, however it may become warmer and drier closer to next weekend (though it is too far away to be certain of that). Karl Melhorn is the founder of the Irish Weather Network. You can check out Irish Weather Network’s updates on Facebook, on Twitter, or sign up for regular forecasts. IWN is also compiling summertime photos for a Facebook summer album which can be submitted to pics@irelandsweather.com. Email “Weatherwatch: We're in for a soaking this weekend”. Feedback on “Weatherwatch: We're in for a soaking this weekend”.